Tilma Group’s director Linda Tillman celebrated ten years of her business by taking us all to New Zealand! We arrive in Auckland from across Australia’s east coast - from Toowoomba to Geelong. Three arrive for the holiday with to-do lists for work (one with a reeeeaaally long list) - the reality of owning a small business. We grab fush n chups for dinner from the corner takeaway. …then back to Auckland via views of vineyards for dinner at the top of the Sky Tower in the revolving Orbit restaurant. Three of the team tried to cope with extreme fear of heights in the glass elevator on the way up with eyes squeezed shut and huddled in a corner… well, they made it up! Cristy, Anna, Kushla, Marie, Linda, Michael, Jen - we survived going to the top of the Sky Tower! 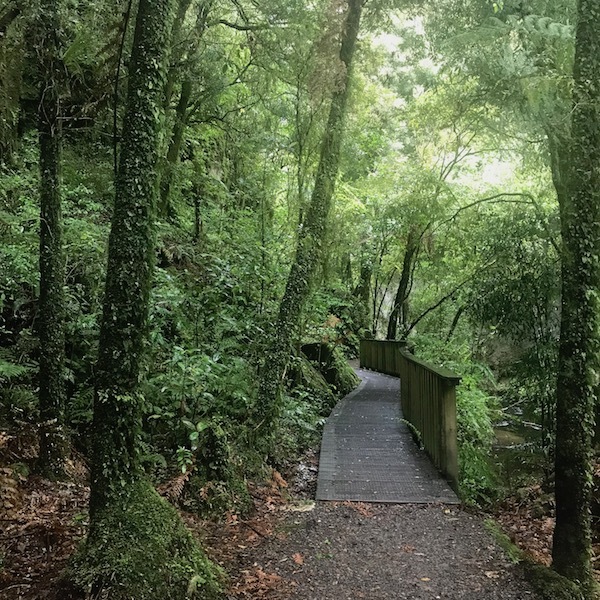 Up early to beat the Auckland traffic and on to Waitomo caves where Cristy and Kushla tubed an underground river under glow worms while the others explored gorgeous walks in the forests around - seriously, these forests were other-worldly! The Visitor Information Centre in Rotorua did a great job of helping us plan and book our stay - and let us know about an interesting walk along the lake where we could see mud pools. We check in to our Airbnb accom just north of Rotorua, which gave us all bach-envy. We could have stayed the whole trip here - with stunning views, kayaks, swimming, a fireplace, wine and board games. 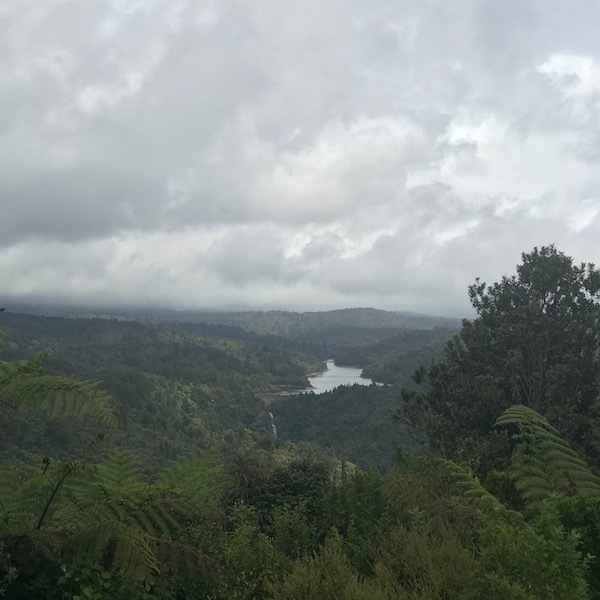 …and back to soak in the hot springs that flow into the icy Waikato River (a wonderful free experience that our kayaking guide told us about). We chose to leave out going to a Geothermal Park from our packed schedule just so we could chill out - a great decision to allow us to enjoy the moment. We made it back to Rotorua to tick off something from Linda’s wish list for the trip: an evening of Maori culture at Te Puia which included dances and songs, a meal cooked in a hangi and watching a geyser spout. A highlight of the kayaking for Jen and Kushla was getting to chat with the very personable guide, Rob, about his life and aspirations while paddling back to base - a valuable insight into modern Maori culture. Stay tuned for Rob’s multi-day tour business opening soon, staffed by at-risk Maori youth. We rafted over a 7m waterfall!!!! We had a ton of fun with the Kaitiaki rafting team doing all kinds of antics like standing up in our raft while going through rapids. Cristy won the award for bravest by conquering a real fear to just give it a go. We regrouped over a delicious Indian meal, each of us sharing what the trip had meant for us - a beautiful moment. …we then travelled back to Auckland where Linda and Kushla met with Auckland Tourism, Events and Economic Development (ATEED) before dinner with Michael and his wife on the wharf, and an early (exhausted) night at our airport hotel. What was the trip highlight for you? 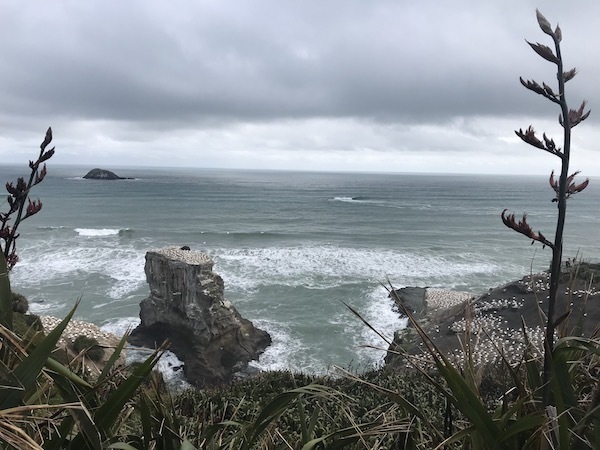 With such a full itinerary and soooo much to see and do in NZ, I really appreciated the impromptu and sporadic moments (and we had a few, which was lovely!). My favourite was in Lake Taupo where we took the recommendation of local tour guide, Taupo Kayaking Adventures, and enjoyed a tough but gorgeous walk to Huka Falls and then a relaxation in the icy Waikato River and adjoining hot springs with a local beer (and great company). It was a special moment in a glorious location! From a regional tourism perspective, what destination/operators are doing great stuff and why? For me it was the experience of the trails in the forests around Rotorua. I loved they were well maintained trails used for equine, training, running/walking and mountain biking. I was very inspired by the quality and beauty of these trails and the ability for a variety of interest groups to use the one location. 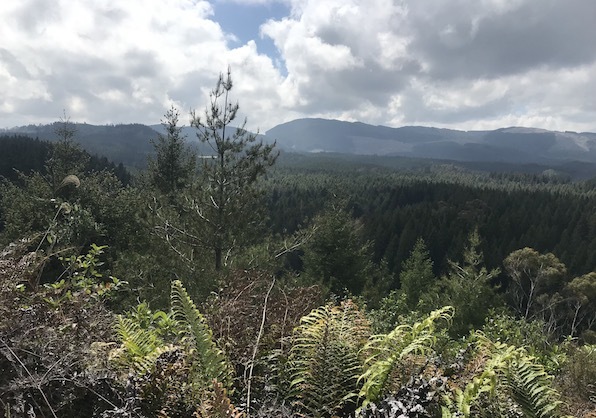 It was wonderful to end our Rotorua visit with a run/walk in the Redwood Forest – my happy place! What destination/operators could improve and how? …well, that’s how it would appear if you took notice of the signage and guides. Anna, Jen and I decided to go exploring for a few hours while Kushla and Cristy escaped into the caves and we stumbled across a natural bridge and rainforest, a hidden cave and amazing waterfalls. I am sure that many other visitors would appreciate these sites and experiences if they knew they existed, but my fear as that they are being lost and forgotten amongst the hype of the shiny attractions and experiences. What did you take away from this experience and the ability to connect and celebrate with Team Tilma? I am extremely grateful to be surrounded by an amazing bunch of ladies. This trip reinforced to me that in order to succeed in business you need to be surrounded by the right people, people that bring different views and perspectives, people with different life and career experiences, and people that know how to have some fun. Definitely our morning kayaking on Lake Taupo. I haven’t laughed as much as that in a long time. It was hard work, but rewarding and a lot of fun. Plus they managed to sneak some facts and education in which I have retained, always a bonus! Did you know the lake is close to the size of Singapore? I also loved how the water was crystal clear. As a graphic designer, I often judge a book by its cover. The professionalism, quality and consistency of all operators we encountered was always of a high standard. From a marketing perspective, their branding was strong, all had a strong social and digital presence, and I have received numerous follow up emails asking for reviews and feedback which shows that they are looking to learn and improve and give their customers a voice. There was an instance where one operator was pushing his staff to ‘prove themselves’ by jumping off a tall rock into water in front of all of us on the tour. One of his staff members was obviously uncomfortable, and it felt to her and to us that she really didn’t have a choice. This was uncomfortable to watch as I know myself, that I would not have been able to do what she did. You can still be a great tour guide without having to prove you love an adrenalin rush. It’s one thing to have the utmost respect and admiration for a group of ladies you work with day to day when our combined efforts on big projects, sometimes with extremely tight deadlines, can ultimately show our true colours. But it’s another thing completely to take the same group of ladies out of their natural habitat, away from their kids and partners and dogs and let them just enjoy. I learned so much more about the team in 5 days that I have in 5 years. That's like asking me to choose which child is my favourite! 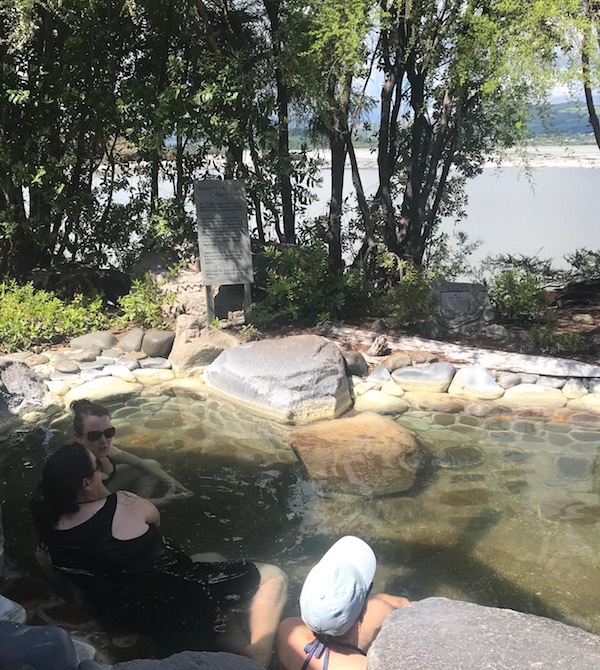 One thing that stands out in my mind was the walk to Huka Falls - which was TOUGH - but the scenery was spectacular, I had a great time walking with Cristy and getting to know her better, and the foot soak at the end in the cold water at the Thermal Spa was bliss! Being a history nerd, I loved the way the Maori culture was woven into every experience. NZ does this spectacularly well, and it put many, many ideas in my mind as to how we can do this better in Australia to tell the story of the traditional landowners. I think there is a lot of opportunity to create and promote trails to discover the 'hidden gems' in certain areas. We managed to stumble across a few on our own DIY driving adventures, but I think there is a lot of opportunity for short, 2-3 hour return drives and some of the sights along the way. Being the token southerner, it was great to see Linda after four years, and to meet the rest of the team for the first time. Such an inspiring bunch of ladies to work with. Bring on the 20th birthday celebration trip! Taking in the beauty of Lake Taupo in the early morning light right before we kayaked. Misty, cool, still and silent. Bliss. I had read about Lake Taupo and its beauty – and I was so glad that it surpassed my expectations. I liked Lake Taupo’s destination online marketing the best (www.lovetaupo.com) – I thought it was simple and relatively easy to navigate – plus my expectations of its beauty was surpassed when I arrived. Just gorgeous. At the end of our tour, the tour operator we used went on to refer to us other highlights of the area, recommending what we should do after the tour to make the most of the area – a bonus. Shows pride. Great to see cross promotion. I also love that Taupo tourism saw a need to create added interest in the area by contracting an artist to carve the Maori rock art that we saw …completed in the late 1970s. It just goes to show that not everything that you go and visit needs to be old; history can be created now. I thought that was a clever way to add in a unique feature to an already beautiful tourist must see: Lake Taupo. Value adding. Waitomo Caves area seemed a bit dated and did not make the most of marketing of its unique and amazing natural beauty. Too focused on tour operators, and moving visitors in and out quickly, rather than as a destination to be discovered. Encourage visitors to stay and explore the surrounding area, encourage road trips, highlight the natural beauty, waterfalls, natural bridge, other caves in brochures; need clearer maps to explain how to reach destinations, explain distances better. I work with an incredible bunch of passionate ladies that are down to earth, genuine, curious, caring, hilarious, warm and have a thirst for adventure and discovering meaningful experiences. I am so incredibly lucky to be working for Tilma Group. The adventure operators have their patter and process down pat to help with moving groups through the experience safely while making their guests feel special with their friendliness. From the rafting company’s website - and they nailed this! There must be a better way to connect large groups with indigenous culture. I personally felt like meat being processed through the Maori cultural experience we went to. Having my eyes opened to how hard one of us was working. My favourite part of the trip was her shucking off the shackles of her workload each day and being totally present and super brave in spite of fears - and she is a gorgeous being to spend time with, with a totally infectious energy that made us laugh till we couldn’t breathe! That was so much fun and so heartwarming. When we as colleagues communicate at a distance it can be easy to miss how hard running a business can be. See you again soon, 100% Pure New Zealand! What happens when 180 regional tourism professionals come together?! Tilma Group Marketing Campaign wins Bronze at NSW Tourism Awards!